There’s nothing quite like the feeling of setting out on a long car journey. The mind is free to settle into itself, to think through recent events or rediscover deep memories. The architecture of the freeway is a soothing and ordered landscape: out of the intricate landscapes of the inner city, through the outer ‘burbs and into the blue tinted mountains; or heading north over brown rivers and through green state forests; or south along the tight braid of the Hume to those seemingly endless wheat fields and startling blue skies of the border lands. I love the strip of highway ahead of me, the line that cuts through the landscape – the unfurling of the big picture across the cinemascope windscreen. It’s hard to imagine a world without cars. The infrastructure of production and sale of the motor vehicle is a global culture unlimited by borders or government control. So too the support industries that surround it, from the vast geopolitics of the production and distribution of oil, to the construction industries that builds roads, bridges and tunnels, to the more benign-seeming services of petrol stations and budget hotels: to think of the car and the highway in the broadest sense is to consider the entirety of civilisation because, where the road ends, another world begins. A vintage photograph recently posted to the Facebook group Lost Sydney shows the construction of the Warringah Expressway, that vast multilane concrete strip that now forms part of the feed that sends cars on to the Harbour Bridge, down the Harbour Tunnel, over to Neutral Bay or into North Sydney. The photograph looks south toward the city and it takes a few moments to fill in the blanks for what’s there now. In its unfinished state the scene looks apocalyptic – a giant swathe has been carved through the landscape, homes, buildings and everything else wiped away for the sake of better access. When you’re driving into that mess these days, on a rainy day when the traffic is crawling, it feels as though you’re driving down into the centre of the Earth. When I think about driving and the freedom of the open road, I think about this too – the other side of the equation – the sacrifice of everything for the mobility of a single person in their car. The utopian order of the highway is something that has always fascinated me. Even as a kid I would stare of out of the back passenger seat of my father’s FJ Holden, the family car with its cream coloured vinyl roof and bench seats, and marvel at the gardens and trees that were planted in the islands between lanes in those manicured lawns and native plantings of the F3 between Sydney and the Central Coast. Like the smooth, futuristic frontages of 1970s era civic centres, libraries and public sculptures, these roadside gardens seemed to me, synaesthetically perhaps, to be related. It was a vision of the world, complete and wonderful in the rust colours of green-blue bronze, native sandstone and white concrete. Little did I know that the origin of the modern highway is a history with a dark side. 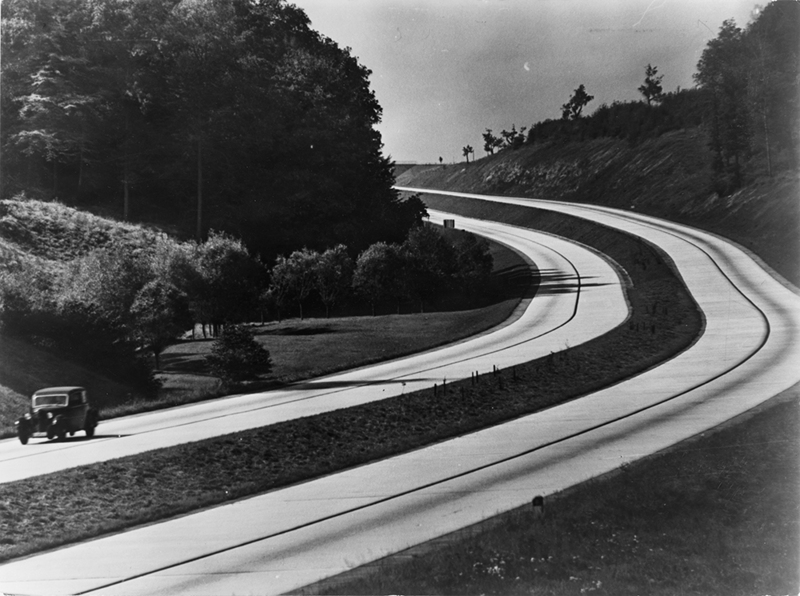 The first modern highway was built in Germany and opened in 1921, but the true precursors of the freeway were the reichsautobahns built by the Nazi Government after 1933. As one might expect of a technocratic dictatorship, the highways were symbols of the country’s modernity and a demonstration of its technical prowess. What is perhaps more surprising is that the Nazis also pioneered the roadside experience, credited by some historians as the originators of roadside landscaping, but also of purpose built stop overs where motorists could enjoy picturesque scenes enhanced with stone obelisks topped by fascist eagles, and adjoined by public toilets. There are photographs from the mid-1930s that show another Nazi innovation: roadside dining in the form of a chain of schnitzelhaus restaurants decorated in rustic alpine style. The highways of Australia owe more to the post war boom of the late 1950s that saw America’s modest network of roads transformed into a mind-boggling system of modern mega-highways that could more effectively transport its nuclear warheads between silos. Australia, always more a target than an aggressor during the Cold War, was ten years behind as construction projects such as the Warringah Expressway got underway in the mid to late 1960s. Now of course, all that’s forgotten as cities such as Sydney and Melbourne press on with the construction of highways and tunnels to connect other already extant highways, tunnels and bridges, transforming the landscape into something little different to those roads and expressways found China or the Middle East. But that dark history persists as a kind of shadow memory over the driving experience. As you head north out of Melbourne there is a series of sculptures that form triumphal arches – yellow fingers and rusted orange metal loops that farewell the driver as they escape to the far countryside. And even there in the hinterland and country towns, you sense an echo of technocratic totalitarianism in the attractive corporate facades of fast food restaurants promising all-hours-access and the false freedom of limited choice. The smaller players in that industry are the strongest links to the past. There’s a rustic European flavour to the restaurants found alongside famous roadside attractions such as the Dog on The Tucker Box outside Gundagai, or the Giant Marino in Goulburn. Old Vienna World beckons to motorists: schnitzels, beer, fruit cake. There is a kind of delirious forgetting in driving. You are required to pay attention and follow the rules of the road, to always be aware of the car behind you, and of any potential dangers. As the speedometer edges over the limit the mind wanders. But to where? Once, after the hour and a half drive home from Sydney, I couldn’t recall many details of large sections of the journey, particularly the 90 kilometres per hour sections guarded by multiple speed cameras. The details were so hazy I began to wonder whether I had been the subject of an alien abduction, taken out of the car for exotic purposes, placed back, then to arrive home otherwise convinced I had never left the vehicle. I could recall no bright lights, no flying saucers, nothing out of the ordinary. There’s a phenomena called highway hypnosis, a fluid hypnotic state induced by the repetition of driving where you give over the task of driving to your subconscious. Certain kinds of music can induce it, genres such as minimal techno are particularly suited to its hypnogogic state, but highway hypnosis – or white line fever as it’s also known – can be summoned by a measured, evenly paced spoken voice, the sort of thing you hear when listening to an audio book. The longer the drive, the deeper the experience. Driving back and forth on long car journeys while listening to an audio book creates a very odd kind of memory: I can recall exactly what I was listening to when I drive again on a certain road, or if I’m listening to that book at home, I have an almost out of body experience remembering a detail of a long drive. For some people the effects of highway hypnosis are so profound they put themselves in danger, drifting into a dream state, or speed, or text or eat in the car, forgetting the ever-present danger of a crash. Highway hypnosis seems to me to be a perfect explanation of our obsession with cars and the world we’ve created around them. We know what we have done, and the impact it has had on the natural world, and although it’s right there in front of our eyes, we can’t see it.